Everyone’s a winner at Sun Bingo. 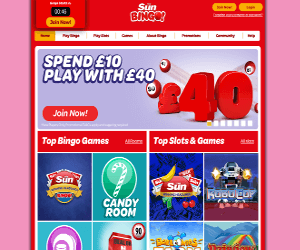 Start your game play with an amazing Welcome Bonus at Sun Bingo and enjoy various games across the site. Start pocketing amazing rewards from games such as: bingo, slots, table games, instant games and more. What Promotions Should You Look Out For? Make your first deposit at the minimum of £10 and play to receive a £30 bonus. The £30 bonus includes £20 Bingo Bonus and £10 Slot Bonus. With this special bonus, you can try out all the games that you want on the site. Don’t miss out on your second deposit offer of 50% match up! This could give you up to £30 to play! Upon your 3rd deposit, claim a 50% match up bonus and play with £50! Join the Cash Cave Room from 12pm every day of this month and stand a chance to win up to £1,000,000! With tickets just at 25p, grab guaranteed wins of up to £700! TGIF! Enjoy bingo games with mega prizes every last Friday, Saturday and Sunday of each month. Enjoy guaranteed wins in: Cash Cave, Deal Or No Deal, Glamour Room, Rainbow Riches, and Rapid Room. Where in each, you have over £10,000 guaranteed! Tune into the Rainbow Riches bingo room every second Friday of the month and enjoy mega cash prizes, jackpots and features! All you have to do is join in the room anytime from 17:00 or 00:00! Stand a chance to win up to £10,000 guaranteed! Sure the promotions make the game play all worth it, but you could also start socialising with other roomies and chat moderators at Sun Bingo! Head over to the “Community” page of the site and meet Sun Bingos hardworking and lovely chat moderators. Enjoy the latest and most popular slot games and trigger massive wins!